Whilst I recently concluded in my UK election forecast conclusion on the basis of the sum of my analysis of the past 6 weeks which aims to repeat the accuracy of Trump 2016, EU Referendum 2016 and GE2015. So on the basis of my forecast conclusion and with 3 full days to go until the polls close the search is on for spread and exchange betting market opportunities. FIRSTLY, understand that trading markets, betting, gambling are HIGH RISK activities. And a forecast is NOT written in stone, it is what I deem to be the most probable. And most gamblers tend to lose in the long run with losses can exceeding deposits. So if you don't have the stomach to take a loss then DO NOT TRADE OR BET! My primary UK election forecast expectation is for the Tories to win the election on 358 seats, a 66 seat majority. My preferred vehicles for betting on elections are the betting markets such as the spread betters and exchange markets. So it could be worth keeping a close eye on the spread betters for significant deviations from my forecast. One of the best strategies is to use stop and limit orders, i.e. for a trade to be executed when a market price hits a particular level which saves one having to constantly monitor a market. Again do remember that betting is high risk and losses can exceed deposits. 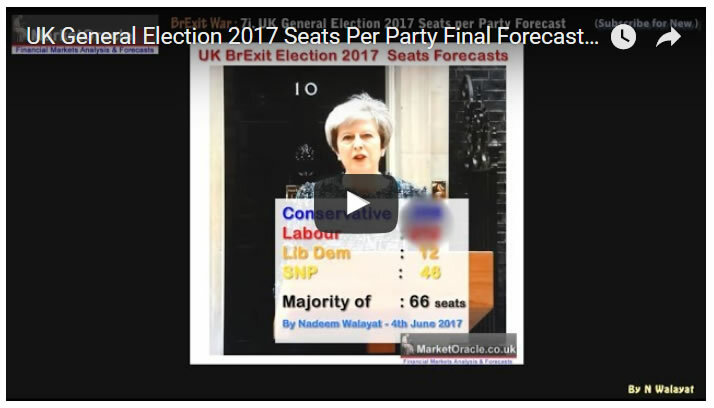 The forecast majority is 66 therefore an high reward profit potential exists given the price of 6.4 for 50-74 seats. However given the tightness of the ranges then there would be a need for smaller hedging bets on either side of the expected range i.e. 25 to 49 and 75 to 99 seats. The opportunity here is a lot tougher as the forecast of 358 is towards the bottom of the range on offer. So this market favours an error in the forecast being to the upside rather than to the down side, for instance not towards what house prices are forecasting (342). Also the profit potential is poor at just £95 per £100 bet. 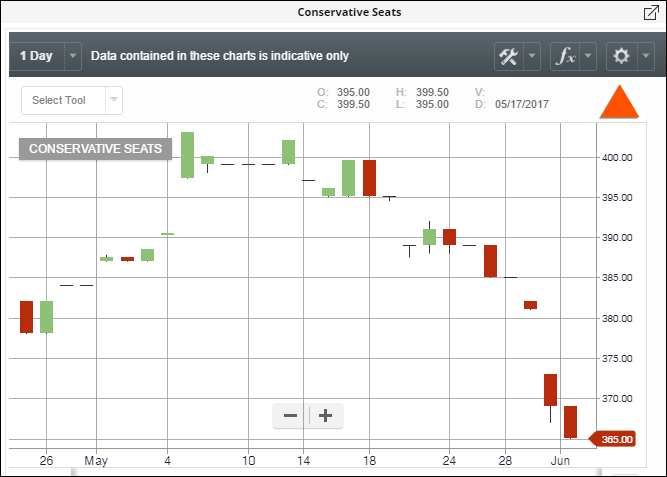 Whilst a bet on the forecast being out by 10 seats would favour the 300 to 349 seats bet price of 3.75. So similarly two bets to cover the range 300 to 400 is probably the better trade here so as to hedge the forecast being wrong on the downside. Again the odds are nothing to shout about but the distance of 371 to 358 gives a 13 seat margin of error for a price of 1.79. So maybe a smaller hedge bet to cover being wrong on the downside. And once more whilst today's prices may not be great, however polling induced market volatility could present a series of opportunities over the coming days, so these final days and hours until the results are known is the time period to keep a close eye on the betting markets. And I will likely once more publish a list of my 'winning' election positions after the election just as I had for the US Presidential election. And remember not to get carried away! Don't bet more than you can afford to lose because it is a gamble!